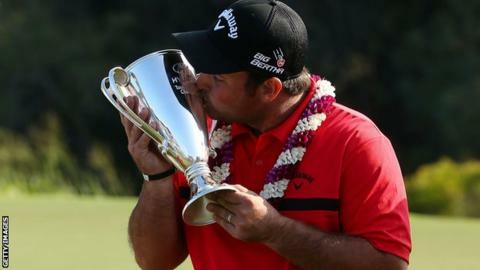 Patrick Reed rolled in an 18-foot birdie to defeat fellow American Jimmy Walker in a play-off and win the Tournament of Champions in Hawaii. Reed, 24, was four shots behind Walker with four holes to play but fought back to seal a fourth PGA Tour title. "I thought my chances were slim but I just stayed patient," said Reed, after he and Walker tied at 21-under. Australia's Jason Day shot a 62 to share third place with American Russell Henley and Japan's Hideki Matsuyama. Reed, ranked 14th in the world, joins elite company as the fifth player in the last 25 years to win at least four times on the PGA Tour before turning 25. The others were Rory McIlroy, Sergio Garcia, Tiger Woods and Phil Mickelson. Masters champion Bubba Watson, the highest-ranked player in the field at fourth in the world, finished six shots off the lead.